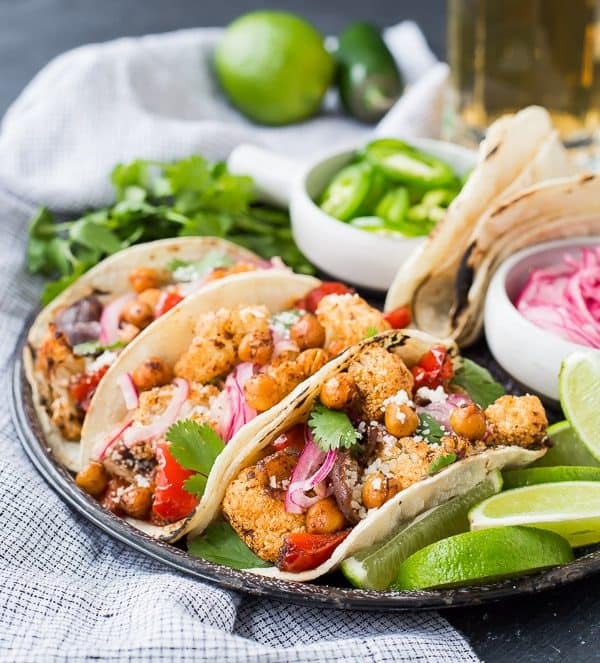 These easy vegetarian cauliflower tacos are full of flavor and protein! Even meat-lovers are going to flip over these fun tacos. 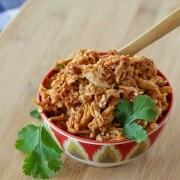 Whether it’s for Meatless Monday or a full-on vegetarian lifestyle, you’re going to love these! They’re also easy to make vegan. 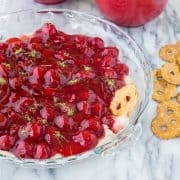 Make them tonight! As this post goes live, I’m on a flight to California. And did ya know that California is going to BE THE SAME TEMPERATURE as Michigan? And rainy! I’m thrilled. I definitely didn’t want to dust off any sleeveless dresses after they spent the winter in hibernation. Oh no, I was realllllly hoping I would be able to bring my umbrella and winter coat. Awesome! Despite the less-than-ideal weather, I am truly excited to head to California and spend time with some of my closest blogging friends on the campus of Google. Yeah, GOOGLE. I’m thrilled to have this opportunity thanks to my ad network (hooray for Mediavine!) and even more pumped to see all my friends who understand this crazy blogging life. I’m excited to learn from the people at Google to help you guys find the exact recipe you need in the easiest, quickest way! Make sure to follow along on Instagram stories if you want to see what I’m up to. I’m also looking forward to eating some fantastic food – my friends at Mediavine know how to throw a great conference! I would like to wave a magic wand and make these appear in front of me. I may have shed a tear the last time I ran out of the ingredients for these cauliflower tacos. 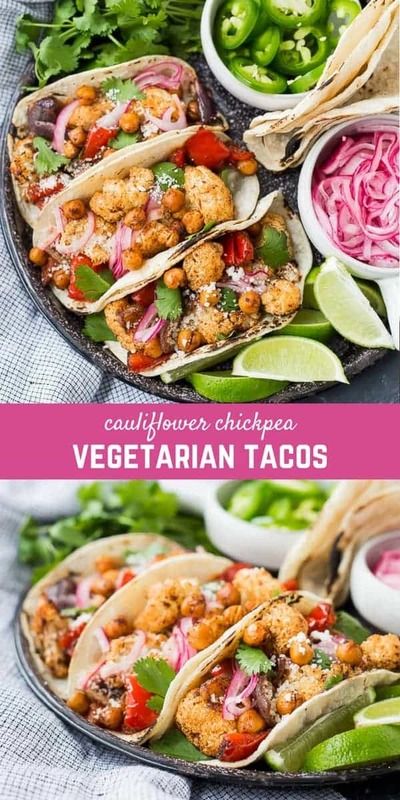 I urge you to make these cauliflower tacos. 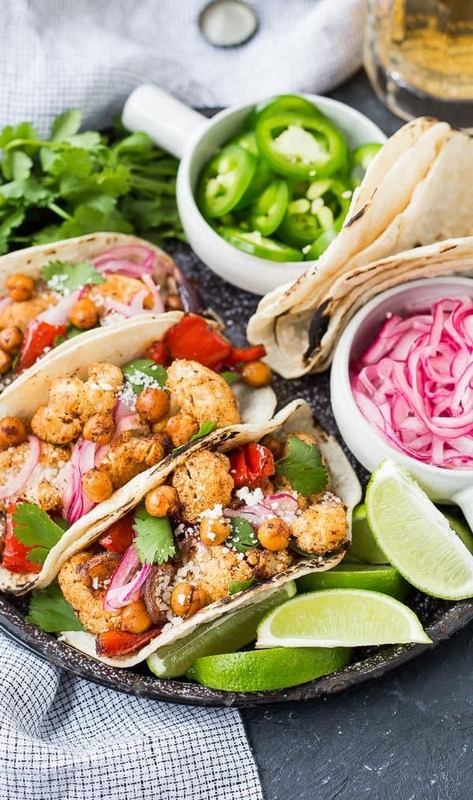 Whether you’re a vegetarian or a meat-loving carnivore, these tacos are a must-try. Another must-try are these vegetarian tacos with delicata squash – they’re so good! You start by roasting cauliflower, chickpeas, onions, and bell peppers. The onions and peppers become ultra-sweet when they’re roasted. 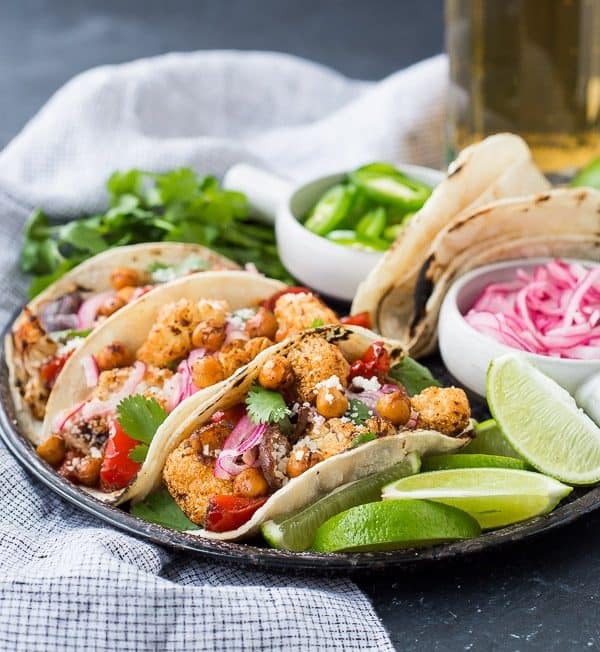 The chickpeas become crispy and add such great texture to these tacos. The cauliflower, well, you know all about roasted cauliflower at this point, don’t you? PS: If you aren’t living the roasted cauliflower life, I gotcha covered. Since the time I showed you how to roast cauliflower, I also gave you recipes for roasted cauliflower with chili powder and Parmesan roasted cauliflower. Make sure you don’t miss my whole roasted cauliflower, either. You will want to drink the sauce! 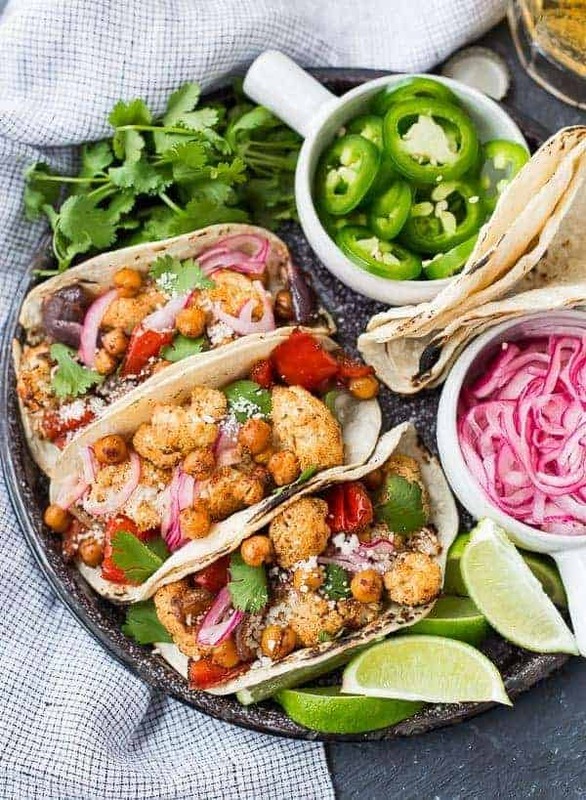 I recommend topping these tacos with avocado, pickled red onions, a sprinkle of cheese, and lots of cilantro. But of course, have fun with it! Use your favorite taco toppings and make these your own. 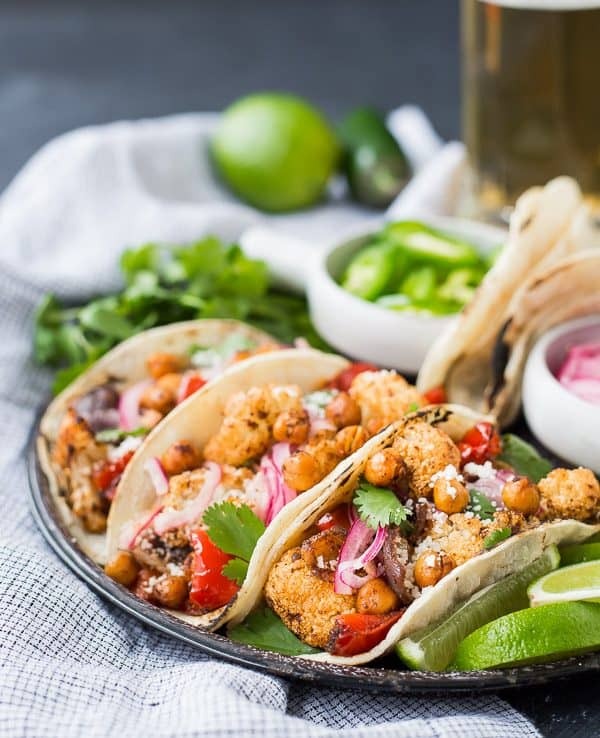 More vegetarian tacos to try: Vegetarian Taco Cups, Zucchini and Crimini Street Tacos from A Spicy Perspective, and Three Bean Tacos from Two Peas & Their Pod. Toppings: pickled red onions, cotija cheese, cilantro, avocado, sour cream, jalapeño, etc. Spread cauliflower, chickpeas, onion, and bell pepper on a rimmed baking sheet. 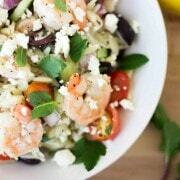 Drizzle with olive oil, sprinkle with chili powder, cumin, garlic powder, and salt. Stir to coat all ingredients with spices and oil. Spread into an even, single layer. Bake for 20 minutes, stir and continue baking for 10-15 minutes or until cauliflower is tender and chickpeas are crispy. 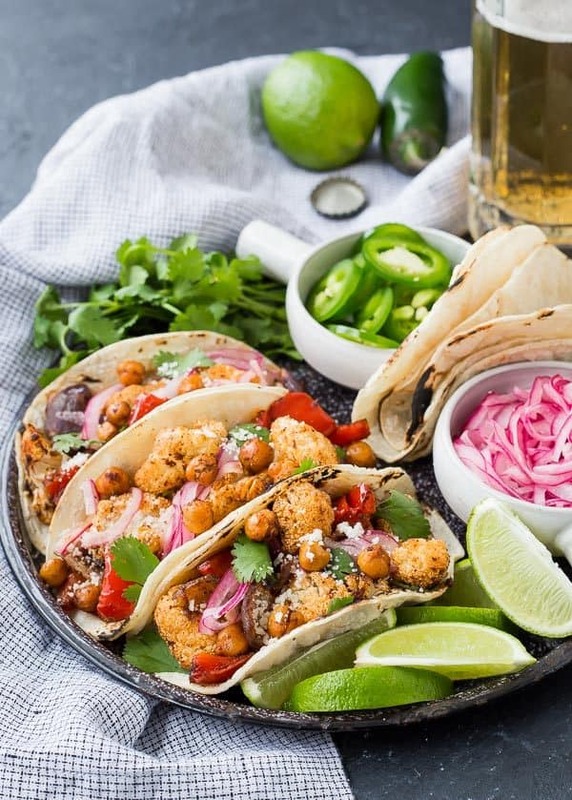 Fill tortillas with cauliflower chickpea mixture and top with your favorite toppings! Make it gluten-free by using gluten-free tortillas or lettuce wraps. Make it vegan and dairy-free by omitting the cheese. Nutrition information includes 2 small corn tortillas, no toppings. Verdict: I’m obsessed. 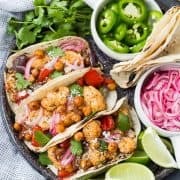 These cauliflower tacos are going in my regular rotation. Husband’s take: Ummm…I don’t believe I shared these with Ben…. Changes I would make: None! I love these just the way they are. I just made this. It was so yummy! There are even leftovers and I may use them in a frittata. Thanks for the great recipes. These are perfect for a meatless Monday – they look so good! Have so much fun at your conference – it sounds so cool! Thank you on all accounts! I hope you try the tacos and love them!